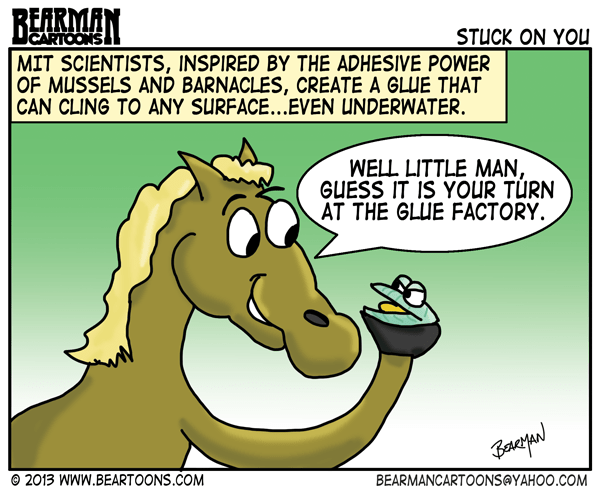 Sure people have made an underwater glue before but scientists at MIT have engineered proteins based on those found on mussels and barnacles (you know that crap that sticks to ships) to create a super glue that can stick to pretty much anything. This has the potential for things as vast as underwater ship repair and surgical adhesion. Now for the most part animal based glue products including horses have gone away as more synthetic glues have become more prevalent. That did not stop the following conversation with my wife the other day. Mrs. Bearman: They use roadkill in their glue. Bearman: WHAT?? Where the hell did you hear that? Mrs. Bearman: I don’t know someone told me that. Bearman: It probably was a bad game of telephone where someone joked about Gorilla Glue being made from real Gorilla and ultimately it gets turned into Gorilla Glue is made from roadkill. Oh yeah. I forgot, I saw the Gorilla Glue roadkill truck on patrol the other day. Mrs. Bearman: Ok it does sound stupid now that you say it. Very popular with horses, yes! Crying cockels and mussels, alive, alive,…and glue! The roadkill truck – maybe that could be a second career for me. You haven’t work with the co-workers I’ve work with. Oh dear, I guess people will have toilet seats permanently stuck to their butts!!! I know it’s true, but hate to think about it looking at the cute horse. Emulators of Esther Williams unite! Yes, I know about these things and that’s true. I also loved your conversation with your wife. A sticky turn of events! Just so long as no one decides to make Wombat Glue. And I’m talking to you, Mr. Bearman! What kind of roadkill is found in Taz? Possums, kangaroos & wallabies mostly. The occasional, dare I say it, WOMBAT, sorry Binky. I’ve never seen an echidna or Tassie devil dead on the road but apparently devils get on the roads eating roadkill at night as they are mostly nocturnal & often become casualties themselves.. Sorry Binky, but I can honestly say I’ve never hit a wombat. Hit a big roo once at night & it did a lot of damage to my front end. Upset me a lot too as I hate to hit an animal on the road. I don’t even like seeing roadkill that others have hit. That would be upsetting to hit an animal. Here it’s mostly deer as the big ones, but just the other day there were two dead racoons on the city streets. Next time you hit a roo make sure to make me a new kangaroo ball bottle opener. those are expensive. Emergency rooms across the world…prepare…. That just makes sense doesn’t it? Thanks for the info. The pictures help me to understand. As weird as spider-goat BioSteel silk.